← February 6, 2013 Jeff Returns For More Lepika Action! 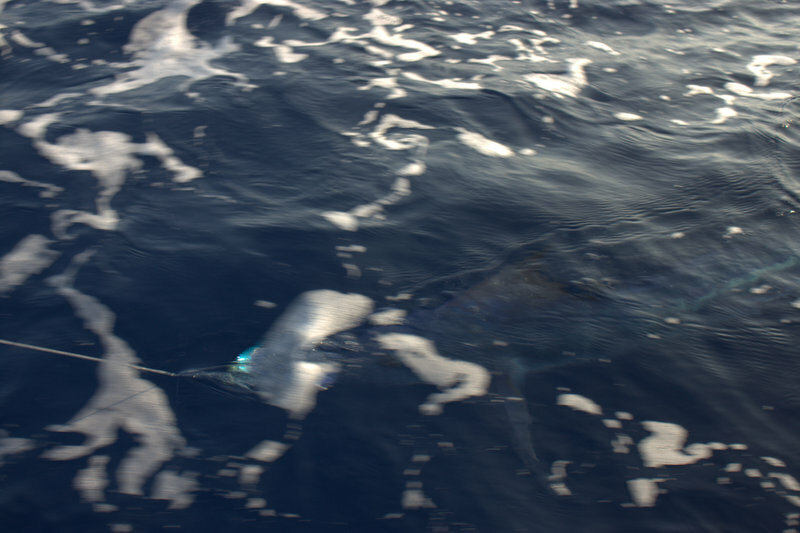 February 8, 2013 Jeff Day 2 – More Spearfish! Today was Jeff’s second day on the water. Again, Mike and Jim came along for the ride. Since the Grounds was proving to be the place to fish the last few days, we headed back that way. Bait was everywhere along the ledge and the temptation was there to live bait but the pas dew days the fish have been biting better on the troll so we stuck with that. Early in the day a nice spearfish showed up on the stinger and this time Jim was up. Jim is from Oahu and has a 33′ Blackfin. He has fought some big fish over there so this spearfish was no sweat for him! He got the fish to leader in about 10 minutes and after taking a few pictures we released it in excellent condition. We trolled the ledge the rest of the day without a bite but we saw several big fish on the sounder but they didn’t come for the lures. Overall fishing was slow and several guys I spoke with saw the same thing…fish on the sounder but no bites. The fish are here and they are gonna have to eat sometime!